Let's set aside our anger and look at the bigger picture for a minute. ICYMI, Bristol-based Zaleha Kadir Olpin was eliminated in the knockout stage of the MasterChef UK quarterfinals after apparently falling short with her nasi lemak, particularly her chicken rendang side dish. 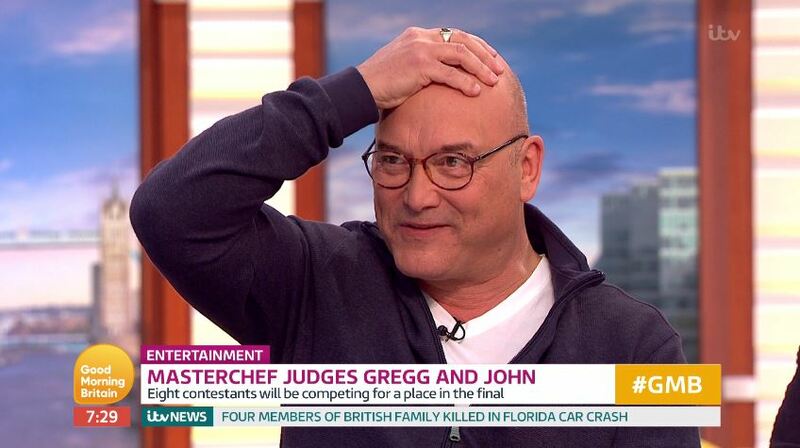 In the assessment of Zaleha's dish, presenter Gregg Wallace was widely reported to have remarked that Zaleha's "chicken skin isn't crispy" and cannot be eaten because "all the sauce is on the skin", while his co-presenter and celebrity chef John Torode told her that the chicken was "tough" and "not really flavoursome". It definitely did not help when John Torode tweeted "Maybe rendang is Indonesian", following a rather ignorant "Namaste" in response to critics. The tweet has since been deleted. Like everyone else, I too had a hard time hiding the "WTF" expression from my face when I found out about #RendangGate. In what universe was rendang ever crispy lah, amirite?! Think about it for a second. As Malay Mail columnist Erna Mahyuni puts it, rendang typically requires hours of simmering "for the sauce to properly dry out and the meat to fully absorb the blend of spices". So think about it for a second - is attempting to cook rendang in such a short, competitive timeframe the smartest thing to do? At this point, I have yet to see the video of the judges' assessment of Zaleha's dish, so I thought I'd do so with a somewhat objective mindset. 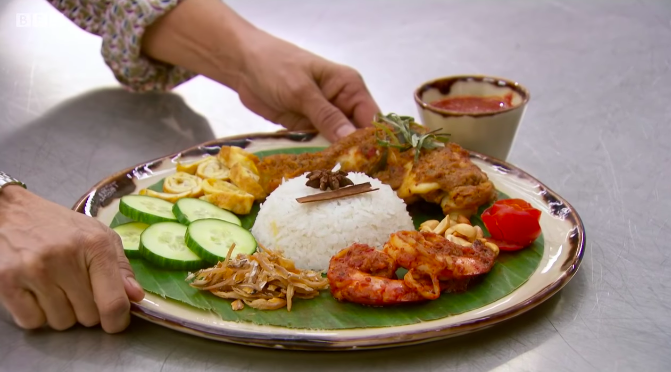 Zaleha (left) presenting her nasi lemak dish to judges John Torode (middle) and Gregg Wallace (right). The original video has since been deleted from the official MasterChef account, though it has been reuploaded by Free Malaysia Today. In the taste-test, this was Wallace's initial impression: "(I) like the sambal with the sweet prawns, coz the sambal itself is sweet. Love the idea of salty flavour coming from those crispy fried anchovies, that is intense." He also said that he likes Zaleha's "rendang flavour, that's like a coconut sweetness", only to follow up with the now infamous line - "the chicken skin isn't crispy, it can't be eaten, but all the sauce is on the skin I can’t eat". 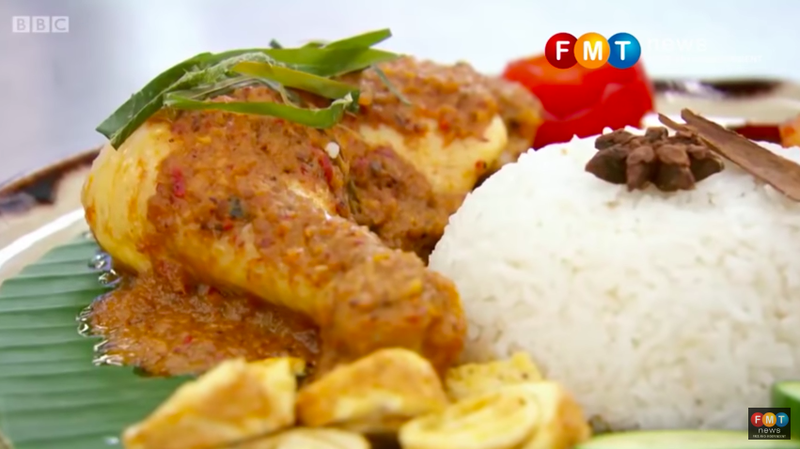 Next up, Torode - who was involved in a 10-part travel series on Malaysian food a few years ago - told Zaleha that having the chicken rendang on the side is a "mistake". "It hasn't had enough time to cook down and become lovely and soft and fall apart. Instead the chicken itself is just tough and it's not really flavoursome." 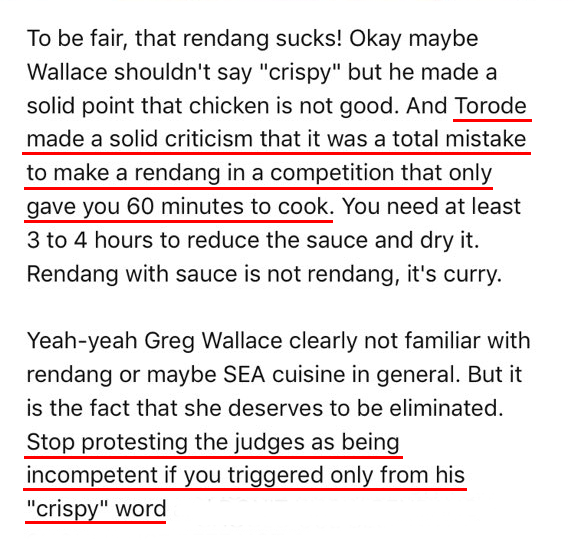 Later on, as both judges were deciding on who to eliminate, Wallace elaborated that he was disappointed that Zaleha's "chicken skin wasn't cooked"
A close-up of Zaleha's chicken rendang. The original video has since been deleted from the official MasterChef account, though it has been reuploaded by Free Malaysia Today. While Torode enjoyed the dish and said Zaleha "made a great nasi lemak", Wallace lamented that her chicken wasn't cooked and unfortunately, "the flavour of the rendang sauce was on the skin". Side note, if you're familiar with any of the MasterChef shows, you'd know that undercooked (and even overcooked) chicken almost always guarantees that it's game over for that particular contestant. 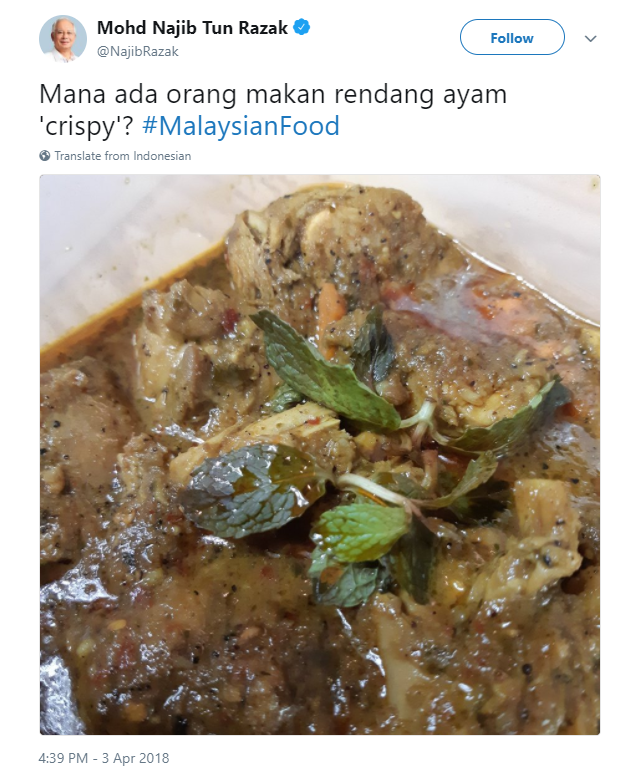 On a similar vein, Facebook user and food enthusiast David Soong wrote a super comprehensive analysis of Zaleha's dish as well as the intent behind the judges' statements, complete with what he thinks should have prepared in the tight time limit instead of a time-consuming chicken rendang. You can read it here. Unpopular opinion aside, I totally agree that "crispy" was definitely the wrong word to use in the taste-test. In fact, even Wallace himself has admitted his mistake in a recent interview. In an appearance on Good Morning Britain today, 4 April, Wallace admitted that "'crispy' was the wrong word", but maintained that Zaleha was not eliminated because her chicken skin wasn't crispy. He explained, "I didn’t mean it should be fried, like fried chicken. What I meant was it wasn’t cooked. It simply wasn’t cooked. It was white and flabby." "She didn’t go out because her skin wasn’t crispy. She went out because the other cooks were better," he said. "Rest assured, the best cooks will always go through." Are we expecting Wallace and Torode to apologise for using the wrong adjective ("crispy") to describe how Zaleha's chicken skin should be... or for eliminating Zaleha from 'MasterChef UK' because her chicken was undercooked? Let us know your stance in the comments section below. The BBC show has released a statement to defend its judges. MasterChef UK Judge Gets Hammered By Netizens After Tweeting "Maybe Rendang Is Indonesian"
"The chicken skin isn't crispy, it can't be eaten."